Those details were revealed in a presentation given November 5 at Stanford University’s annual “PNT Challenges and Opportunities Symposium.” In April 2007, China launched the first middle-earth orbit (MEO) satellite for Compass (BeiDou-2), which the nation plans to turn into a full-fledged GNSS system within a few years. 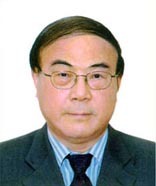 In a subsequent presentation at the International Committee on GNSS (ICG) meeting taking place this week (December 8–12) in Pasadena, California, Jun Lu, of the China Satellite Navigation Project Center, said that four satellites would be launched in 2009 and an additional six during 2010. Sponsored by the Stanford Center for Position, Navigation and Time, the symposium presentation was authored by Chong Cao on behalf of the China Satellite Navigation Engineering Center and Guifei Jing, head of the Navigation Division of the National Remote Sensing Center, Ministry of Science and Technology of China (NRSCC/MOST). Due to the failure to obtain visas in time, their presentation was given by Ming Luo, a former Stanford researcher who now works in Beijing. 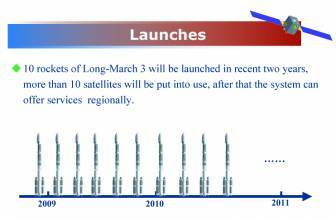 A viewgraph displayed during the talk (see accompanying figure) shows 10 Long March-3 rockets against a timeline that seems to indicate a launch in late 2008 and nine more through mid-2010. 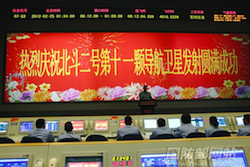 However, Lu’s subsequent presentation indicated that the launch schedule will be less ambitious than that. China will develop Compass on a "step-by-step" basis, she said, "based on the technology and economy level of China." The China Satellite Navigation Engineering Center is responsible for building the system, which is designed to eventually have 5 geosynchronous satellites and 30 MEO spacecraft. Three GEO satellites have been launched since 2000 for what Chinese officials call the Compass navigation demonstration system, which can provide some basic services including positioning, timing, and short-message communication. The demonstration system’s users obtain positions calculated at a ground monitoring center, but the fully operational Compass system will enable handset-based positioning as with other GNSSs. Compass will offer 10 services — five free “open” services, and five restricted “authorized” services — centered at eight different carrier frequencies. Accuracies for the open service are specified as 10 meters in stand-alone mode and 1 meter from a real-time wide-area differential service. At the recent 2008 China (Hefei) Forum on Compass Navigation Technology and Industrial Development, Cao said that the total output of China’s satellite navigation industry will be 300 billion yuan (US$50 billion) by 2015, according to a report in People’s Daily. In Hefei, he was speaking in his role as Director of the Compass (BeiDou) Civil Application Market and Industrialization Expert Committee. Cao also reported that said, Chinese manufacturers — mostly small and medium-sized enterprises — are involved in navigation satellite applications in China, with about 800 out of them specializing in GNSS goods and services. 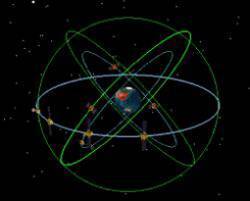 Compass will be improved to five meters in 2010 as scheduled, and that the construction of Beidou 2 will be completed in 2012. By 2020, according to Shao, the system is expected to have a positioning accuracy of one meter.